H & E Weatherization insulates all types of buildings: Residential, commercial, and agricultural, this includes new and existing buildings. Types of insulation used are: fiberglass batt insulation, energy blanket on basement walls, cellulose wall spray, and attic applications. 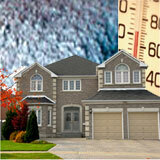 H & E Weatherization is fully insured.